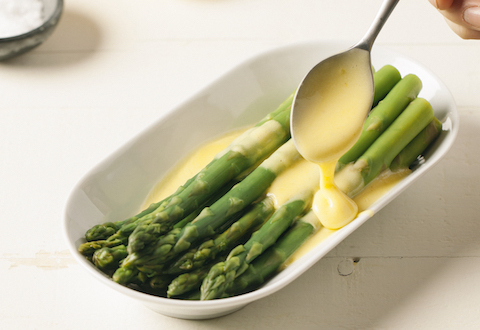 This rich, smooth French sauce is delicious served over eggs, fish or steamed vegetables. In a small stainless steel or glass bowl, whisk together the egg yolks and lemon juice until they begin to froth. If the mixture is too thick, you can thin it by adding cold water, 1 teaspoon at a time. Bring a small pot of water to a gentle simmer. Place your bowl over the water and continue to whisk. Slowly pour the melted butter into your egg mixture, whisking continuously so the eggs don’t scramble, Continue until the butter is gone and you have a thick sauce, about 5 minutes. Remove from heat. Add cayenne, salt and pepper to taste. Adjust the thickness with an additional squeeze of lemon juice or splash of water. Pour over eggs, fish or steamed vegetables. Must be kept warm and served immediately.